All the advertising looked to be paying off, as we arrived Friday morning to find that our favourite spot was already accommodating a number of campers. We immediately staked out our territory, and set up all the tents we had. Attendance for all three days was up compared to last year. 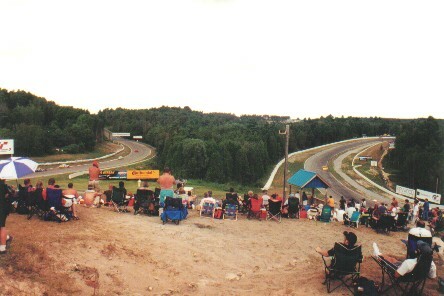 It's unfortunate for Mosport's PR crew that the weather was uncooperative on Sunday, as I'm sure they would have had a massive crowd. It sure seemed to be building that way. That said, the crowd sure looked to be larger for the race this year compared to last (it rained last year, too). 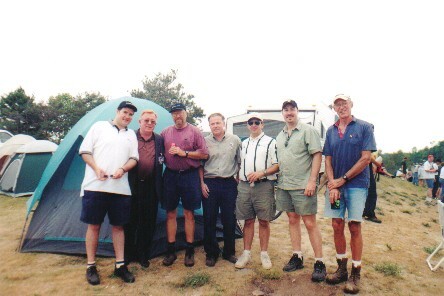 We started with two day visitors (Peter and Rob 1) and three campers (Paul, Ted and Rod) Friday. Below are Ted (purple shirt), Peter and Rod. We had Don Panoz cruise our site (above, between Peter and Ted). 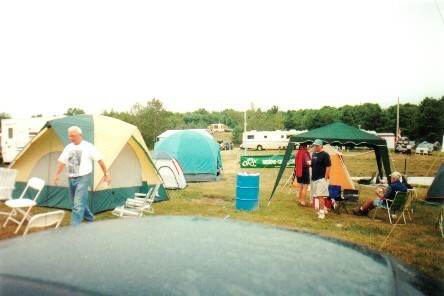 After Ted is Myles Brandt (Mosport manager), Rob 1, Paul and Rod. Peter and Rob 1 returned Saturday morning as campers with two new campers (Ron and Rob 2), and Dennis dropped by as a day visitor. Finally, Scott and his two boys, Haden and Josh, showed up Saturday night to camp. L-R: Rob 2, Ted (red towel over shoulder), Scott, Rod. Corner 3 looking at corner 2, Saturday. Corner 5 - Saturday. Good crowd. Some of the crowd at corner 5. 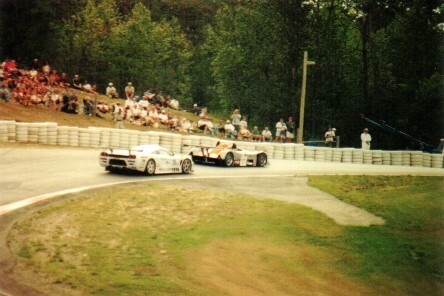 Saleen and Lola in corner 5, Saturday practice. 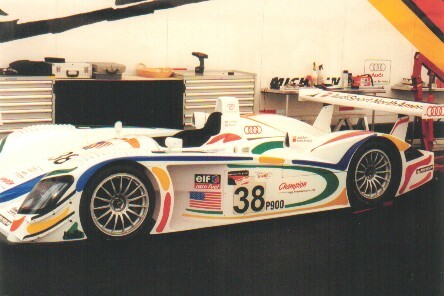 Champion Audi in the Paddock. 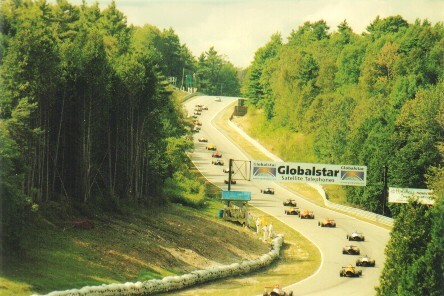 Star Mazda race, Saturday (looking from Corner 5 at 5c and 6). 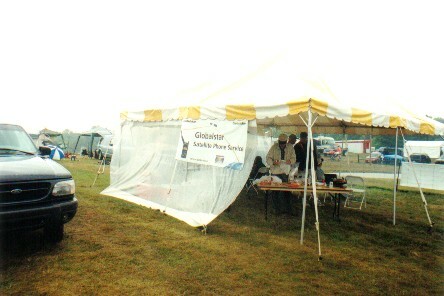 The Globalstar tent comes in handy for Sunday's lunch! 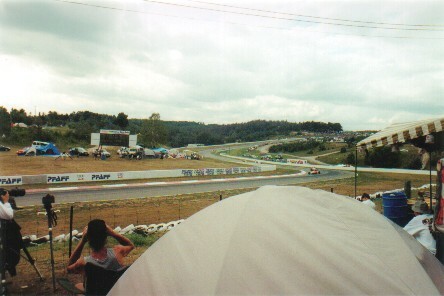 The racing was terrific, and there was much in doubt as to who would win right up to the final few laps. The #50 Panoz of Magnussen and Brabham had the pace of the Audis for the first hour and a half, but dropped off to finish two laps down. 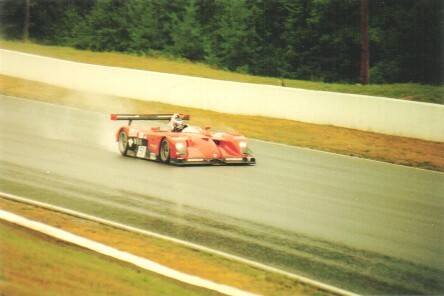 Audi #1 was injured on the first lap, and went multiple laps down before returning to run for about two thirds distance. Audi #2 was in the lead and being successfully hunted down by the #38 Audi until 15 minutes left, when the #38 Audi crashed heavily, ending its race. The Cadillacs (#7 & #8) were dicing with Dyson, as the Riley and Scott #16 fell behind with mechanical problems and clawed its way back to their tails for the last 10 minutes before having a mishap and having to settle into 5th. 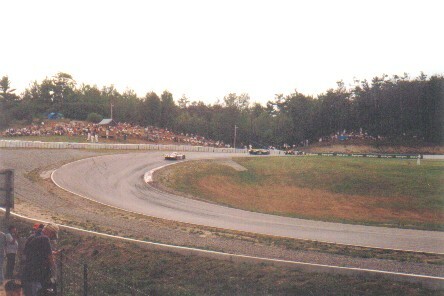 In GTS, Ron Fellows ran away and hid (although somehow his rear end was torn off, apparently in turn 3).